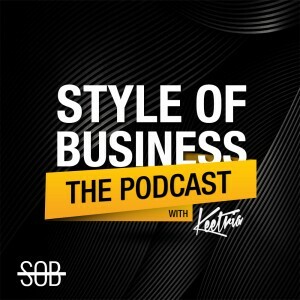 On this episode of Style of Business, your host Keetria interviews Saba Tekle, award-winning best selling author, publisher, mentor, and founder and CEO of 7 House Media. She wants to help women find their passion and purpose and shine a light on inner beauty. She needed self-help, development, spiritual advice, and mentorship. She found authors whose vulnerability and story helped heal her. She wanted to become an author and learned a lot about the publishing industry. She genuinely believes that when you provide enough value, the universe will serve you. Why do you think people love the message in your books so much? It’s not an everyday conversation that’s happening in the book. The book is tailored to healing and empowers you via what women have been through. Talk about some of the services you offer with 7 House Media. The most dominant thing she teaches on is publishing. She offers mentorship for her authors. What are one or two key things you didn’t know before as a publisher? At first, publishing wasn’t the goal, the writing was the goal. She knew she needed a different skill set if you wanted to write and publish. Talk about your newest of your series. The content is people who took their pain and made it their purpose. She gets compelled when she sees how her books have benefited people. She takes note of what she gets from her authors and what helps people. Any current plans to expand the brand further? The 20 Beautiful Women challenge came out of nowhere and over a million people participated. She wants to continue and expand on the momentum. It’s the most beautiful thing if you can express what’s actually on your mind. It’s magic, beautiful, powerful, and healing. If you’re clear about your intent and niche specific, God will move everything for you. What it’s all about is what you think of what you do. Do you have a specific process when you’re trying to come up with a storyline? First, check in with your soul. Find people that you trust to mentor you and let things develop. Start with a blank page – you’re putting out an intent that you’re going to write something. You have to be willing to bet on yourself. She gets inspired, she’s free spirit. What motivates her is an inspiration. There’s just one you, you can’t do everything for everybody. When you provide value you’ll gain value in return. Be clear about your intent and your niche. Find people you trust to mentor you. When you provide enough value, the universe will serve you. Enjoying your journey is the most important part. Writing is magic, beautiful, powerful, and healing.